The following are extracts from an email received from Geoff Ayling, who lived in Manilla from 1939-1948. Geoff has recalled some interesting history about Manilla during those years. For a story about life in Manilla 1955-1964 click here. Geoff would be pleased to receive any correspondence from Manilla people who recall these times. I was very encouraged upon finding your website with photographs of life in Manilla. 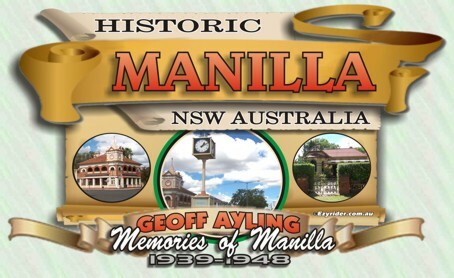 I lived in Manilla from 1939 to 1948 and went to the Manilla District Rural Public School. My family first lived on the corner of Court and Hill Street, then on the corner of Strafford and Hill Street. It appears among your photographs that you have shown the home owned by the McKenzie family where we lived in Strafford Street. In those days we had a tennis court which does not show in your photograph. My father was employed at the Commonwealth Bank during the war and was then transferred to Bathurst. In 1949 he was transferred to Tasmania. There is much I would like to know about homes and people, many of whom have now all gone. The only person I know who is still alive is Ken Moy, who has moved into the town upon the sale of the family farm at Rushes Creek Road. I have looked up the Manilla General Cemetery records and have found many people I knew. My father was the Captain of the Manilla Rifle Club. The mayor of the town was Alton Richmond McLeod, who had been a keen rifle shooter and was captain of the NSW Rifle Team. He died about 1951. I often wondered where Tony Vere, the daughter of the Headmaster of the school, eventually resided. As well, I would like to know where Kay Harrison is now living. She was the daughter of Bill Harrison who was employed on the NSW Railway and I think later owned the picture theatre. His wife succeeded him and by now would have passed on. I can remember the vacant block on the corner next to the picture theatre when the building on it was on fire. That was during the war. Half the town came out at night to see it burning. What happened to the McKenzie house with the tennis court? Your photograph does not show the beautiful jacarandah trees and white fence around the whole property. Someone told me that there had been a family murder there sometime after 1948. Is it being looked after today or does it remain empty? You will be just as aware as I of the temporary nature of residency of many people who lived in Manilla. From the encounters I have had with Manilla people living in other Australian States, there is no doubt that more than 90 percent of those I went to school with have grown up and made their lives elsewhere. Two of those people for example approached me in Hobart, Tasmania to say that they remembered me at school in Manilla, i.e. before 1948. Hence, your search of events in the past has had to be largely from people who have tended to remain in the Manilla area. There were however 10 times as many people from Manilla who lived elsewhere. I certainly did know Grant Harrison from the time he was brought home from hospital as a baby about 1948. I saw him again as a little kid when I visited Manilla in 1959. His father Bill was by then advancing in his efforts to own half the town. I imagine that Kay married and left Manilla. In 1996 I was driving through on the way to Sydney and visited her mother for about 30 minutes, when she told me Kay was living in Gunnedah. By then Bill Harrison had died. I could not find a record for him in the General Cemetery. I was then on a one-month visit from China, to then go to live in Hyderabad, India. On that occasion I visited Don and Fay Moy, also Ken Moy. I was glad I did visit because in that year both Don and Fay died. It is quite a coincidence that you were employed at the McKenzie house opposite the Church of England. I also had the job with my young brother of spreading cow manure from our kids' billy cart over the entire garden. We were however just slave labour. Your photograph shows the beautiful jacarandahs, palm trees and citrus grove missing. I guess they do not last forever. In the back yard were two huge fig trees, one blue and the other golden. But they also appear to have disappeared. You may remember that the McKenzie family also owned another home directly across from the church in Strafford Street. During the war my task for our family was to take a can of milk each morning across to Miss McKenzie. We milked a cow in the garden at a small holding shed located next to the chook run. Then in 1948 she asked us to vacate when she thought her nephew would want to return to the house upon being released from a prisoner of war camp in Thailand. We had a feeling that he never returned from that camp. Instead, my father received a transfer in his job and we moved to Bathurst. War-time was interesting for Manilla kids. The crossroads at Hill Street and Strafford Street, with the church on one corner was a regular bombing run for pilots training at the Commonwealth Air Pilots Training Aerodrome near Tamworth. In 1942-3 we used to watch several Kittyhawks in their camouflage colours flying low around the town. Those pilots were sent up to New Guinea where they were all shot down near Port Moresby. In 1944 I well remember young pilots in Liberators would wave to me as a kid as they took a run down Strafford Street and opened their bomb-bay doors, right over my head as I would walk over the cross-road. I don't know whether I will be able in my 70s to return again and see the museum. I do know that young Austin Kelly used to return each year to Manilla. By now he must be about 85 years of age. I found records of graves for his parents. If you are interested to document wartime life there were two major centres of interest: the Manilla Road Training Camp of the Australian Army (out of Tamworth) and the Empire Air Training Scheme airfield, also at Tamworth. Manilla regularly received visits from trainees on exercises from these camps. I described to you the aircraft that regularly flew around the town. However, these young fellows were all destined to join units fighting against the Japanese. Our family had contact with a relative who had just joined up in the Army when I was a very small child in 1941. That unit at Manilla Road was then sent up to a camp at Camooweal, west of Mount Isa. They arrived in Singapore at the end of 1941, just in time to be met by the Japanese Army, which sent them all to Changi and to work on the Burma Railway. A small number were sent to Sandakan in Borneo where all were murdered. These blokes were all from the Manilla Road Training Camp intake of 1941 and came from all over NSW. During the early part of the war it was common to find men on leave in Manilla, who were in uniform: the Australian Army, RAAF and airforce people from the UK, Canada and the US. Most of them were billeted in homes around the town. They also took up available accommodation in the pubs. The overseas airforce blokes were there because the Tamworth aerodrome was a base for all kinds of aircraft, which were being prepared for departure to the north of Australia. You might also like to try to obtain accounts from people who were kids at the School, where each week until the end of 1945, there were assemblies where fathers who would not be coming home were honoured. The heads of the school at that time were a Mr Hunt (Senior School) and Mr Vere (Junior School). The assemblies were for the school to advise of the need for sensitive consideration needed for kids, who had suddenly ceased to come to school upon their mothers receiving the worst possible news. The notes I provided would definitely have rung a bell for many families who had someone among the prisoners of war on the Burma Railway. They had been trained in 1941 at the army camp on the Tamworth Road. They arrived in Singapore shortly before the Japanese arrived, only to have the English general in charge at Singapore decide the gallant thing to do was surrender. Many pilots who flew over Germany from 1942-43 on, had been trained at the Tamworth Airstrip. There were many nationalities who trained there. I can remember a Mrs Campbell who lived next door to us in Court Street (second house down from Hill Street; we were on the corner until 1944) because she used to host groups of those blokes as a home away from home. Her own son was already away and serving. I was a kid and used to climb up on the fence to watch all these blokes arriving in airforce uniforms at the home of Mrs Campbell. Later on as kids we would be amazed at fighter aircraft in camouflage colours wheeling around over our houses with pilots waving to us.